Project named Strengthening Procurement System at the sub-national level, SPSL launched its new target areas in Kean Svay district, Kandal province on 19th Feb, 2016 at Kean Svay district hall. Around 45 people from different sectors such as, officials from Kean Svay district and NGO partners, and local citizens. 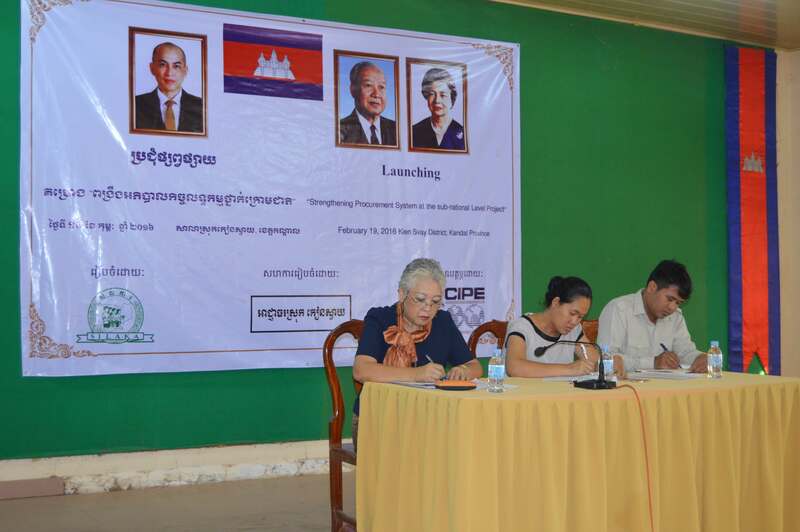 The launching aims to disseminate the main objectives of SPSL project to shareholders and local citizens, and open to applicants who are interested to become members of Joint Procurement Monitoring Committee (JPMC) in Kean Svay district, Kandal province. In opening remark, Ms. Thida Khus, the Executive Director of SILAKA said “in Kompong Thom province, The Provincial Investment and Development Director showing that the competitive contract awards is 50 percent cheaper than before the project started and that is due to the competition has been improved and the opportunities for collusion and corruption have been reduced”. Ms. Rain Kanika, Deputy Governor of Kean Svay district is warm welcomed to have CSO join district procurement committee to observe every bidding and cooperated with SILAKA to work strengthen procurement system at the sub-national level in Kean Svay district. The SPSL project is expanding its activities in new two targets areas, Kean Svay district and Takmao city, Kandal province. The project of Strengthening Procurement System at the Sub-National implemented by SILAKA which funded by CIPE.